Dr. R.C. 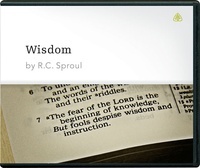 Sproul explores this topic by surveying five Old Testament books known as the “wisdom books.” He explains that to the early Hebrews wisdom meant an understanding of how to live a life pleasing to God. He teaches that the Hebrew believer was in awe of God and feared Him, much like a child who adores and respects his father, and therefore fears doing anything that would violate their loving relationship.